lupo sol 2017. Con la tecnología de Blogger. Lupo is a figurative painter who paints scenes of life, memories, contradictions, twisted thoughts. He likes expressionism and his style mixes several influences. When he was a boy he loved comics and drew characters. His first contact with oil was at age ten, although the experience was not very rewarding, because he soon left the academy he attended, after painting some models of landscapes. Lupo devoted himself several years later to music, fanzines, free and surrealist poetry ... until his transfer to Madrid to work as a graphic and web designer, only painting some pastel paintings from time to time. After a decade as a formal employee, he went to Alicante to live with his partner, Vida. There he was able to resurrect his pictorial vein and survive the dominant "normality", dedicating himself more than ever to his art. His fixation and clear pictorial influence have been the expressionists of the twentieth century, especially Kirchner, Chagall, Munch, Ensor ... to mention a few. The sarcastic touch reflected in many of his works or drawings comes from other sources, closer to Robert Crumb, for example, than Otto Dix, George Grosz and other artists who painted on social issues. 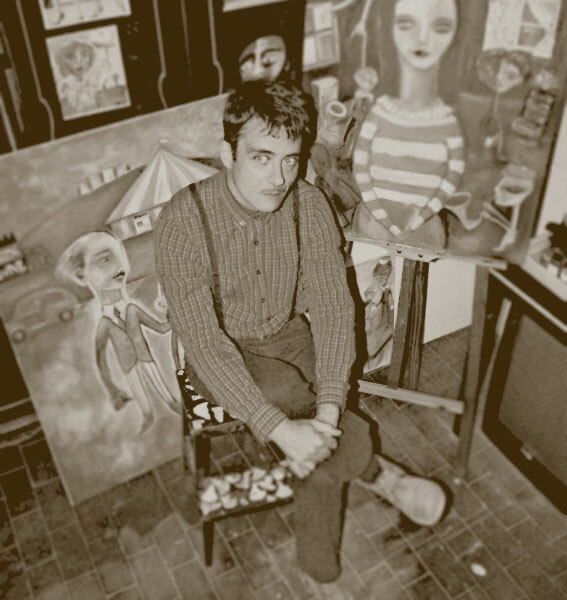 Lupo identifies with the group of Stuckists, a movement that demands painting and the purest art. He is not interested in conceptual art (if this is what he would call art in a more just world), even abstract painting looks at it reluctantly, although he considers honorable exceptions. The grotesque characters are his predilection; the human figure deformed by society, and almost always in paradoxical situations. With all this he wants to build a career, a way of life. He knows that it is complicated, but he wants to burn his cartridges and exhaust the possibilities, learning and giving color to a sometimes too gray environment. Yellow Life Scenes Opening December 2, 2017 from Ron Throop on Vimeo. International Stuckism at Watkins Glen. 50 National painting contest Vila de Sant Joan d'Alacant. The Stuckist at Cass Art Islington. Illustrations for the book by Dani Llabrés. Centro de Cultura de Gijón (Spain). August 2016.